Pentreclawdd Farm, Oswestry, operates camping pods and a caravan site, with a seasonal Christmas tree and Christmas shop business. 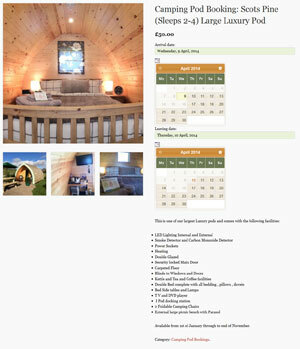 They came to us to build their first website when they opened in 2013, to which we added online bookings for the pods and caravan site. We created a mobile responsive WordPress website, using the WooCommerce e-commerce platform to handle accommodation booking. This booking area also served as a booking system for the business, as it allowed phone bookings to be added manually, providing a single place to manage bookings and payment. The booking system went live in early 2014, and rapidly became a success, earning more than five times the cost of its development in its first season alone. Sales more than doubled again the following year and continued to rise in 2016. During that time we hosted and maintained the site and ensured it continued to work reliably. Pentreclawdd Farm decided to replace the site in late 2016 with another developer.